It's a pity that I will be flying off to Krabi this Saturday because I would really like to join Melvita Malaysia's Earth Month Activity, Organic Farming and Visitation at Ladybird Organic Farm, Broga. I can imagine how fun it would be especially when you go in a group to learn about organic farming and ingredients that's beneficial to us. Lunch will be provided and you get to bring back your own plant too. As a token of appreciation for your support, you will also get a Melvita Door Gift. Just remember to RSVP by filling up this form here that I created so I can send it to Melvita for registration. You will need to wait for confirmation from Melvita and all questions in regards to pick up & drop off can be directed to them then. Thank you for registering early with me. The registration is now closed as seats are limited. Kindly wait for Melvita to contact you for confirmation. Coach and lunch will be arranged, please inform Melvita early should you be unable to participate in this activity to avoid food/seat wastage. Melvita and Loccitane are under the same company. Melvita was founded in 1983 in the Ardèche Gorges in France, by biologist Bernard Chevilliat. It was his love of nature and his knowledge of biology, that combined to form his mission to develop personal care products as close as possible to nature. Today, Melvita is one of France’s leading certified organic beauty brand offering over 300 products designed to use everyday by the whole family. yeah wish I could too... thanks Illy! I can't wait to see Krabi for the 1st time!!! yeahhh thanks Hanna!!! omg.. i just don't know which one to bring... hmmm... Senka perhaps the 50spf one! yeahhh farm trips are out of town.. but will be so fun to explore, they provide pick up and drop off at their hq @ amoda building, jln imbi though..
hi..can bring mother or sister go as well ? 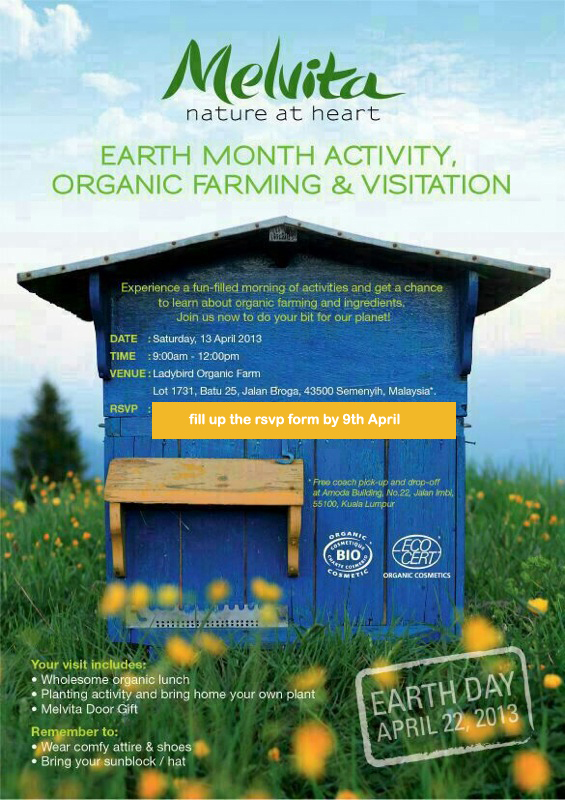 This Organic Farm activity held at Krabi? Submitted my name :) hope manage to get a seat . Hi Tammy, Once again many thanks for the brilliant opportunities you put up....would love to this this with my kiddos.... any age restrictions? Melvita did not state any age restrictions, how old are your children btw? Good judgement Sharon, I admire what you have just said :) and surprise there's still people out there who would appreciate an educational activity that would benefit your child. Kudos to that. good luck! and have a safe trip Tammy! take care! Announcement: The RSVP Form is now closed due to overwhelming response. The RSVP list has been sent to Melvita and they will contact everyone for confirmation (number of pax registered). Please check with them on the pick up/ drop off (time etc?) directly when they call you to ensure you have a smooth journey this Saturday. Melvita is arranging for coach service & food to be prepared for registered guests, I ask that you be considerate and inform them early if you have an emergency and can't visit anymore to avoid wastage of food and seats. the other person's website link on your page at suitable place and other person will also do same for you. I'm gone to tell my little brother, that he should also pay a visit this web site on regular basis to get updated from latest information. Received a call from Melvita on Wed and was informed not being selected for the Visit, sad... Anyway, thanks Tammy for giving those Lucky one a change to visit the farm and learn more on organic things.